The Angeles Chapter of the Sierra Club Hundred Peaks Section reports: "Shoemaker Road was originally intended to be an escape route from the Los Angeles area in case of a nuclear attack. It was begun in the early days of the Cold War. It was soon abandoned as it was too expensive and a poor idea." Today, this well-graded dirt road penetrates several miles up the East Fork, on the east-facing slope hundreds of feet above the river. And then it ends. No peak. No waterfall. No campground. The road just stops abruptly in the thick brush on a steep mountainside. 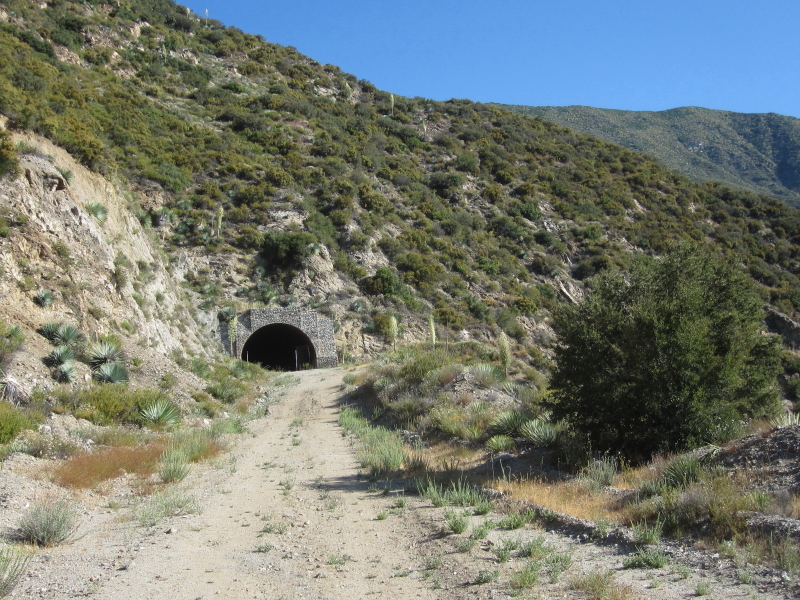 I suppose you could name the second tunnel as the destination, since, after emerging from the tunnel, the maintained road ends and there's nothing but bushwhacking through brush and foxtails where the road used to exist for another half mile. However, Shoemaker Canyon Road provides an opportunity for a nice stroll through some rich chaparral with splendid views down into the canyon below and to the eastward high country above: Iron Mountain (8007') looming above, and in the background, Mt. Baldy, Telegraph Peak, Thunder Mt., Timber Mt., Cucamonga Peak, and Sunset Peak. This hike is almost entirely in the open with no shade. Avoid hiking this trail in hot weather. On a June day when I hiked Shoemaker Canyon, it was not too hot, but the sun was relentless on the return. Some pleasant breezes helped. Lots of reflective light; wear sun glasses, and of course sun screen. Or hike in the early morning or late afternoon when it's cooler and the surrounding topography provides shade. From Interstate 210 in Azusa, take Azusa Avenue (Hwy 39) north about 12 miles to the junction at the East Fork Road (8.6 miles from the forest station at the mouth of the canyon). Turn right (east). Cross the bridge and drive 3.3 miles to Shoemaker Canyon Road on the left. Turn left unto Shoemaker Road and drive 2 miles on paved road to the locked gate. Park in the parking area. A National Forest Adventure Pass is required. Walk past the locked gate and head north up the road. As you walk, occasionally you'll want to scale the berm on the right to get views east down into the canyon. At about 10 minutes there's a flat area on the left just past the large two-sided road cut. 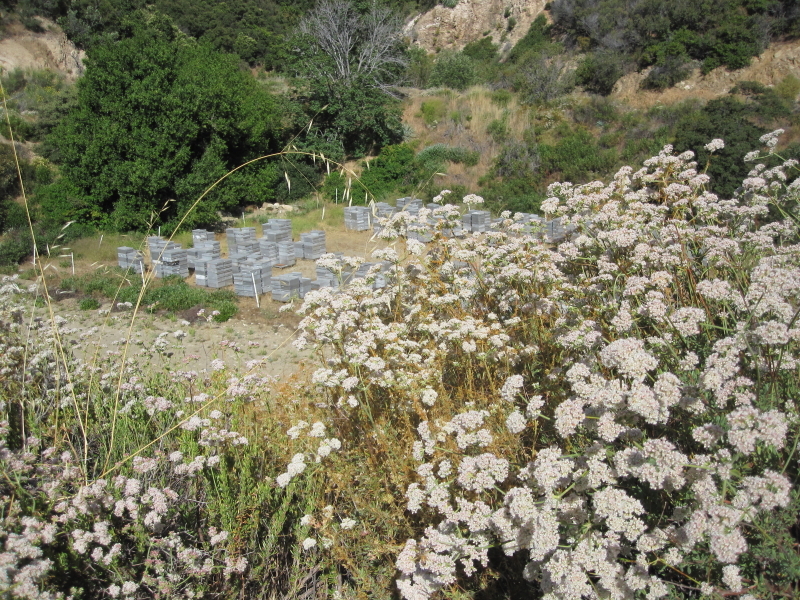 In a certain seasons there is a colony of bee hives. At 20 minutes there's a nice view down to Heaton Flat campground. When the campground is in use, you can hear voices of loud campers. Heaton Flat Trail can be seen snaking up the canyon east from the campground. After another 15 minutes you'll arrive at the gully described in the Sierra Club 100 Peaks Section as the route junction for Rattlesnake Peak (see below). After 8 minutes from the gully is the entrance to the first tunnel (1.65 miles according to my calculations with Topo! software). The inscription on the keystone is 1961. Painted on the wall just inside on the right is the notation, "Ele. 2785." It takes a good 5 or 6 minutes to walk the length of the tunnel (on hot day, the tunnel's cool shade is a nice reprieve from relentlessly pounding sun outside). Past this second tunnel is where the maintained road ends. Unless you're wearing long pants and prepared for bushwhacking, this is where you'll want to turn around and head home. The last half mile of road past the tunnel is overgrown and harsh and offers little reward except a nice view back south down the canyon. Return the way you came. Shoemaker Canyon Road is indeed an interesting and historical walk, worth two to three hours on a Saturday morning. Looking south from a brusy mountainside. The road-cuts from Shoemaker Canyon Road scar the mountains. Heading south on Shoemaker Canyon Road. Thick, mature chaparral blankets the terrian. Upper End of Shoemaker Canyon Road. The red line follows the route based on aerial photos. The blue is the bushwhacking trail for the last half mile beyond the second tunnel. The USGS and Harrison maps do not show the second tunnel, but the tunnel extends a couple under yards past where the maps indicate the road ends. See full topo map (100K). Note differences to USGS topo map. I calculated 2.56 miles to the end of the second tunnel, where the maintained roads ends. The distance from the end of the second tunnel to the end of the passable route is .44 miles. Thus a 5-mile round trip hike on the maintained road and 6 miles round trip to the end to route. The Thomas Harrison map, "Angles High Country Trail Map," shows the mileage from the trailhead to the end as 2.2 miles, which is actually the beginning of the second tunnel. My calculation is 2.46 miles to that point. Jerry Schad in Afoot and Afield in Los Angeles County lists the hike at 5.5 miles round trip, thus 2.75 one way. However it's not clear if his mileage is based on the end of the road (at end of the second tunnel) or to the end of the half-mile path beyond the tunnel. He does write, "Beyond the second tunnel there's a great view of the East Fork gorge and its mile-high east wall culminating at 8007' Iron Mountain." The USGS top map is confusing and does not match my field observations and comparison with aerial photos. It appears that the map shows the road route that was planned rather than that which actually exists. See topo map (100K). The map also shows two roads down to the river, but I saw no such passable routes but did see that there may have been some trails years ago. I do not recommend leaving the road to go down to the river unless you're ready for serious trail blazing through dense brush and steep terrain. The Harrison map cites an elevation at the trailhead of 2300' and 3000' at the end, which aligns pretty close to my calculation using Topo! software. Thus 700-foot gain at 318' per mile. Schad reports 900-foot gain (at 2.75 miles), thus 327-foot gain per mile. The elevation note on the wall at the south end of the second tunnel is pretty illegible. It appears to be 2945, which would coincide with the USGA topo map at 3000' and my calculation with Topo! at 2996'. At the north end of the tunnel, the inscription is 2956.05. I drew the route on the topo map by tracing the road on aerial photos, which I had superimposed over the map in Adobe PhotoShop. Then I drew the route by hand in Topo!, copying a print-out of the PhotoShop image. Thus, the process of creating the route in Topo! is prone to some inaccuracy. Bottom line, don't worry about the map and exact numbers, just hike up the road for a couple miles until you pass through the second tunnel. If you're prepared for bushwhacking, you can forge on for another half mile. If not, head back. Figure that you've traveled about 5 miles round trip, gaining between 700 to 900 feet, averaging 220 to 360 vertical feet per mile. But more important than these numbers is the temperature. If it's a hot day, a 4-mile hike can feel more like 7 miles. 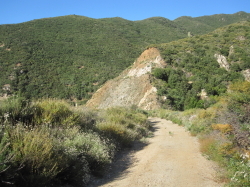 The first section of the Rattlesnake Peak (5826') route is on Shoemaker Canyon Road. The Sierra Club Hundred Peaks Section gives this description: "From the parking area (2300'), pass the gate and hike up the road 1.5 miles to a gully shortly before a deep two-sided road cut. If you can see the entrance to the tunnel you have gone too far." See my Rattlesnake Peak page. LocalHikes.com - "Shoemaker Canyon Road, East Fork San Gabriel River" - by Dan Simpson, yours truly. An abbreviated version of this present description: Brief summery. Driving directions. Photos. Topo map. Shoemaker Canyon Hike and Adventure - by Linda Ainsworth. Informative and detailed trip report. Shoemaker Canyon Road - by Tom Chester. Links and references. Rattlesnake Peak - Sierra Club Hundred Peaks Section - The Angeles Chapter. Description of lower end of trail and historical background. Rattlesnake Peak - by Christopher E. Brennen (Adventure Hikes and Canyoneering in the San Gabriels). Description of lower end of trail. Provides topo map. 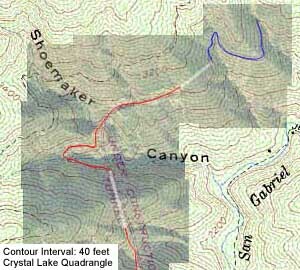 My topo map (117K) of the Shoemaker Canyon Road part is more accurate since it is based on aerial photos. Afoot and Afield in Los Angeles County - by Jerry Schad (Wilderness Press: Berkley). 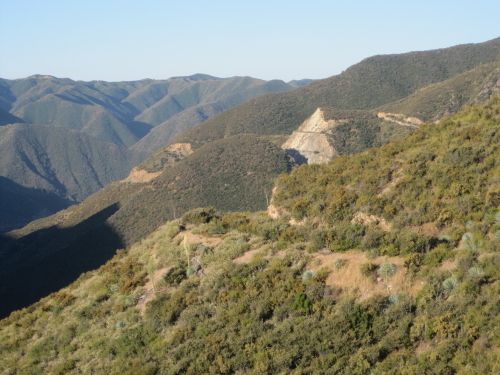 Area A-13, Trip 6: "Shoemaker Canyon Road." Good trail description with historical background. Puts it at 5.5 miles round trip with 900 feet in elevation gain. Los Angeles County: A Day Hiker's Guide - by John McKinney (The Trailmaster, 2006). "Shoemaker Canyon." Good trail description with historical backgrouond. Puts it at 5.5 miles round trip with 800 feet in elevation gain.